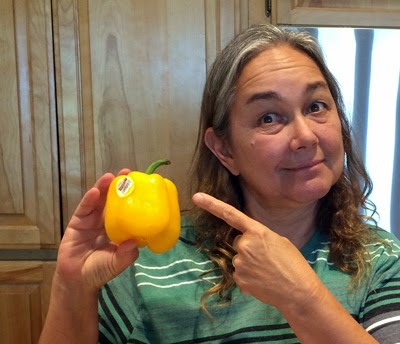 Oma loves the taste and color of the yellow bell pepper. Peppers are seedy and thus categorized as fruit. Most of the differences in bell pepper color stem from time of harvest and degree of ripening. Green peppers are bell peppers that have been harvested before being allowed to fully ripen. While green bell peppers usually turn yellow-orange and then red this is not always the case. Red, orange, and yellow bell peppers are always more ripe than green ones and therefore require more time in the ground before they can be harvested; that's why they are more expensive. Bottom line: all of the bell peppers originate from the same species of plant, and they achieve their different colors naturally, not by any artificial means. Yellow bell peppers are a good source of vitamin C. A medium bell pepper has just twenty-four calories.